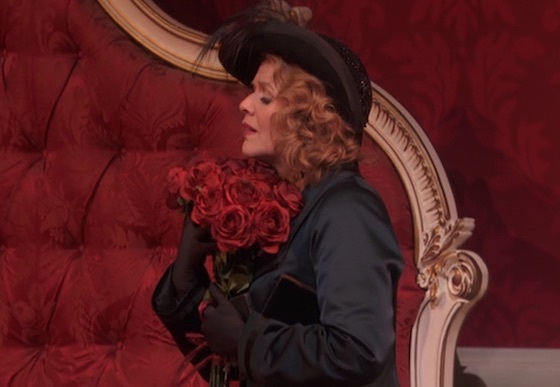 On May 13, 2017, at the Metropolitan Opera, Renée Fleming and Elīna Garanča gave their final performances as the Marschallin and Octavian, respectively, in Richard Strauss's Der Rosenkavalier (The Rose-Bearer, 1911). The occasion was broadcast in the Met Live in HD series; although we were forced to miss the event (and a later scheduled broadcast was cravenly cancelled at the last minute by our local PBS station), in November this performance was released on DVD and we finally had a chance to see it. 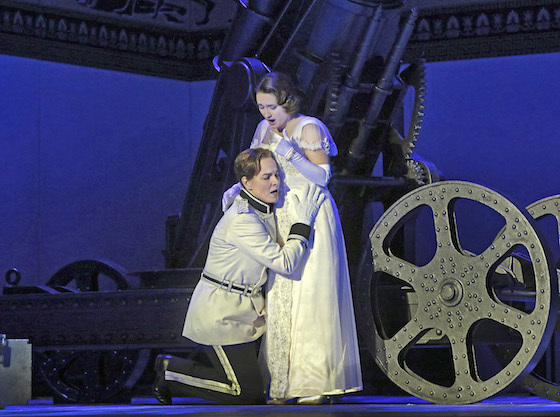 Robert Carsen's production is set at the time of Der Rosenkavalier's premiere, just a few years before the outbreak of World War I. The Austrian society in which it takes place is already highly militarized, and the production is full of signs of the impending conflict. The three orphans who plead for alms from the Marschallin in the first act are cadets, both Octavian and Baron Ochs and his retinue wear military uniforms, and in the third act the inn is full of soldiers on leave. The opera opens, not in Marschallin's boudoir as usual, but in the anteroom outside it. The door opens and Octavian wanders out in his nightshirt for a post-coital cigarette; soon he is joined by the Marschallin. But later when they are back in the bedroom and Baron Ochs is trying to gain entrance, the Marschallin mentions that her footmen will prevent him from coming in. If footmen are waiting outside her bedroom, wouldn't Octavian and the Marschallin have been seen when they went out for a cigarette? They are not indifferent about witnesses because later in the act they are very keen to conceal Octavian's presence. 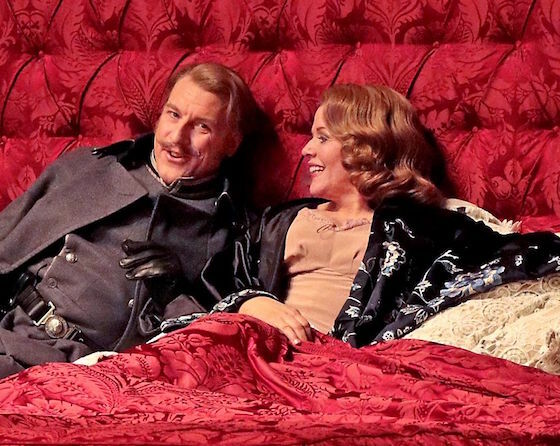 To avoid this inconsistency there seems to be no compelling reason for the opera not to begin as it usually does, with Octavian and the Marschallin in bed together. Baron Ochs, the impoverished rural relative of the Marschallin who has come to Vienna to marry a rich middle-class girl, is younger and more vigorous than usual (Günther Groissböck is wonderfully appalling in the role). This accords with Strauss's own conception of the character. While Ochs is usually portrayed by basses in their 50s or 60s, Strauss wrote that "Ochs must be a rustic Don Juan of 35." However, Strauss also wrote that Ochs "is after all a nobleman, if a rather boorish one...who knows how to conduct himself decently." Carsen directs this Ochs to flop down next to the Marschallin while she's still in bed and maul her chambermaid "Mariandel" (Octavian in disguise) right in front of her. His rampant lecherousness and heedless sexual aggression make him a kind of Harvey Weinstein avant la lettre—but it's hardly likely that the Marschallin would tolerate these lapses (or that an Ochs who "knows how to behave decently" would commit them). Strauss also wrote that most productions "have presented him as a disgusting vulgar monster with a repellent mask and proletarian manners. . . This is quite wrong." When in the early morning Ochs bursts into the bedroom of the Marschallin, Octavian hides in a closet and emerges disguised as the servant Mariandel. In most productions he is dressed in a maid's outfit, but that raises the question of where the clothes would have come from. (Surely the Marschallin does not keep a chambermaid's costume in her closet for emergencies.) In this production Mariandel's costume is clearly one of the Marschallin's dresses, a choice which makes more sense (ladies' maids often received their mistresses' cast-offs). During the levée (a kind of late-morning open house) many visitors enter the Marschallin's chamber: the orphans mentioned earlier, couturiers, sellers of exotic animals, purveyors of scandal sheets. 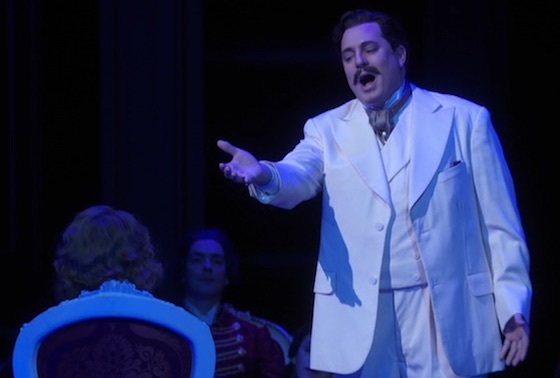 Among them is the Italian Tenor (Matthew Polenzani, costumed to look like Enrico Caruso; he even signs a 78 for the Marschallin), who sings a love aria. Clothing is a significant marker of class in an opera where those distinctions are very important to the characters. When the Marschallin is finally fully clothed, her black dress and beige blouse look like something a bourgeois housewife of the time would wear, not something that a princess would don to go out in public. During the levée we've just seen a fashion show of fabulous period gowns; why would the Marschallin choose to wear such a drab outfit? There's no wartime austerity yet. The act closes with the Marschallin alone onstage. In most productions this moment is treated as an extension of her great scene with Octavian a few minutes earlier in which she laments the passage of time and the inevitable end of their affair, "today or tomorrow." Traditionally she gazes into a hand-mirror, and then slowly lowers it (in Strauss's words) "half weeping, half smiling." This moment foreshadows the glorious trio in the final act, in which she recognizes the moment that she must give up Octavian has come all too soon. But Carsen has Fleming play the end of Act I differently. On his return Octavian has brought a bouquet of roses, which he places on her bed. When the Marschallin is alone in the final moments of the act, she picks up this bouquet, holds it in a way that suggests an embrace, and then gazes around the room one last time. She is clearly flooded with tender memories of the night before, rather than with sorrowful anticipation of the inevitable future. This choice subtly changes the dynamic of the trio in the third act, making us think the Marschallin may be even more unready to end the affair than she is usually portrayed. The second act opens in the ultramodern house of Faninal, the rich merchant who has betrothed his daughter Sophie to the Baron. Sophie is portrayed by Erin Morley, who like most Sophies looks a bit too mature for the role. Sophie is supposed to be 16; Morley seems almost ready to play the Marschallin herself. In traditional productions we learn that Faninal has made his wealth by "supplying the army"; in this production he is an arms dealer. How can we tell? Two huge howitzers are parked in his reception room, and just in case we didn't get the connection, boxes of ammunition labelled "Faninal" lie scattered about. These props don't seem to be intended as entirely symbolic, that is, not actually present, since the characters regularly interact with them. And later Faninal and his servants brandish rifles. But not only is this bizarre (surely Faninal would not actually have military hardware in his house), it doesn't accord with Faninal's aspiration to be accepted into the nobility. Would he not attempt to disguise rather than flaunt the source of his wealth? Later in the act Morley nicely captures Sophie's outraged shock at the Baron's gross over-familiarity. In this context the Baron's grabbiness works better than in the first act. It reads as a manifestation of his contempt: he doesn't feel that he has to behave well with the Faninals, since they are of lower social status. It would be more effective, though, if he hadn't been just as boorish in front of the Marschallin, who significantly outranks him. But it's in Act III that Carsen makes his biggest miscalculation. In traditional productions the scene is set in a seedy inn where the Baron is hoping to seduce Mariandel; in Carsen's staging it is an outright brothel, complete with a bevy of prostitutes clad in merry widows and garter belts. That Sophie or the Marschallin would ever enter such an establishment, much less sit or lie down on a bed in one, defies belief. The setting also undercuts much of the humor of this sequence. In traditional productions Ochs believes that Mariandel is an inexperienced girl; he plies her with wine but to his dismay she becomes maudlin rather than amorous. In Carsen's production Mariandel is dressed as one of the prostitutes, and brazenly comes on to a flustered Ochs. But again this doesn't make sense: for one thing, Ochs must realize that the Marschallin would not have a prostitute for a ladies' maid; for another, what would Octavian have done if Ochs responded with eagerness rather than confusion? So Carsen is keenly attentive to some details but oblivious to others, and makes some jarring and/or nonsensical choices. His production does not compare favorably with the subtlety and elegance of, for example, Otto Schenk's 1979 production for the Bavarian State Opera in Munich, which remains a first choice on DVD. This isn't only a matter of adherence to the creators' specified settings, but of telling details in the interactions among the characters. In preference to Carsen's version, on video I would also recommend the 1985 production from the Royal Opera House and Paul Czinner's 1960 film of the Salzburg Festival production. That said, Elīna Garanča almost single-handedly redeems the proceedings. Her Octavian is one of the best I've ever seen or heard. It's not only a matter of her looks, which are convincingly boyish to an almost uncanny degree. It's also her physical and vocal characterization; she is every inch the ardent young suitor. In her between-acts interview with Polenzani (thankfully moved to the end of the DVD as an extra) she mentions that she has been playing the role for 17 years (coincidentally, Octavian's age); on the evidence of this performance she could have continued to play him for another decade should she have chosen to do so. 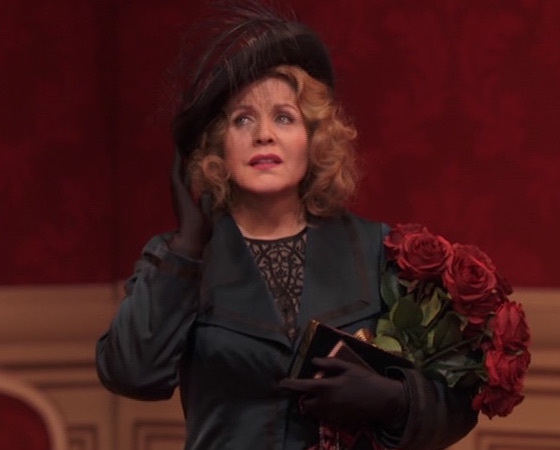 I have a sentimental connection to Fleming's Marschallin: she sang the role in the first Rosenkavalier I ever saw, 17 years ago at San Francisco Opera, with Susan Graham as her superb Octavian. But her performance as directed by Carsen in this production doesn't quite muster either the emotional vulnerability or the inner fire of Gwyneth Jones in the Munich production. Neither is she as coolly aristocratic as Kiri Te Kanawa in the Royal Opera House production or Elisabeth Schwarzkopf in Czinner's film. One key moment encapsulates the differences. In the final act, when Ochs finally realizes what Mariandel/Octavian was doing in the Marschallin's bedroom, it is a moment of real menace. "I don't know what I should think of all this," he blusters. The Marschallin cuts him off. "You are, I believe, a gentleman?" she replies. "Then you will think absolutely nothing. That is what I expect of you." Fleming utters these lines almost with a smile, as though colluding with Ochs. But at this point the Marschallin isn't suggesting her complicity with the Baron. He is desperate, looking for any way to salvage his wedding with Sophie, and he has just understood that he might be able to blackmail the Marschallin. In contrast to Fleming's insouciance, Gwyneth Jones shows a flash of anger that lets us understand that the Marschallin recognizes the danger; Kiri Te Kanawa and Elisabeth Schwarzkopf are commanding, as though it is inconceivable that Ochs could disobey. Fleming's half-smile suggests unconcern, and so prematurely dissipates the dramatic tension. In her book The Inner Voice Fleming wrote, "it has always been my goal to stop when I choose to and not when I have to" (p. 146). Her retirement of the role of the Marschallin raises the question of whether she will continue to perform in staged opera. Although she insists that she is not completely retiring, if these are her final opera performances it would be fitting. 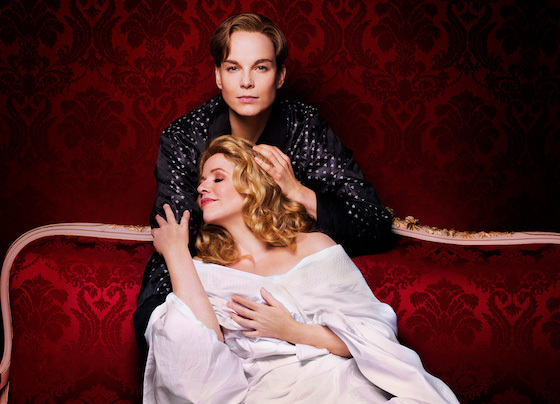 After all, Der Rosenkavalier is an opera about recognizing when the moment has come to let go even of the things we most cherish, and bid them a fond farewell. 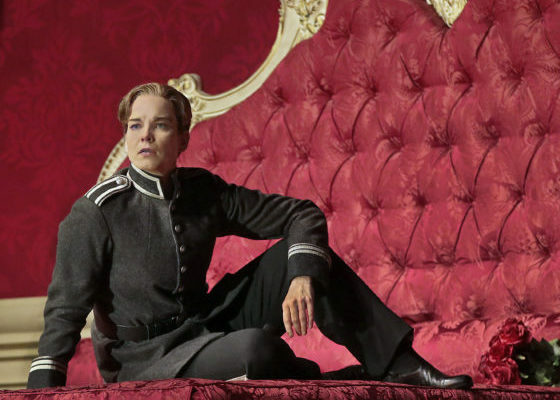 Opera Guide 3: Der Rosenkavalier: a fuller synopsis with more musical clips and recording recommendations. The Rosenkavalier trio: an exploration of the sources of Hugo von Hofmannsthal and Count Harry Kessler's scenario as outlined in Michael Reynold's Creating Der Rosenkavalier, one of my favorite nonfiction books read in 2017.